Goldsplinter Studios, Chris Perryman’s woodworking shop in Asheville’s Kenilworth neighborhood, is an exercise in the maximization of space. From the vessels and chopping boards that make up his kitchenware line to a desk and stool in mid production, his work and equipment are meticulously organized in the garage beneath his home. Perryman, a Winston-Salem native and fourth-generation woodworker, moved to this space five years ago. However, an element of his original studio in town, which housed a coal company in the early 1900s, still makes its mark on his pieces. Much of Perryman’s work bears three grouped circular cutouts, which are an homage to shotgun blast holes in the back of the old building’s freight elevator. “A nod to one of Asheville’s mysteries,” he says with a smile. The refined cutting and serving boards which make up the Scattergun Collection, all include the design signature, while boxes for dry goods are accented with elements such as milk paint and charred lids. 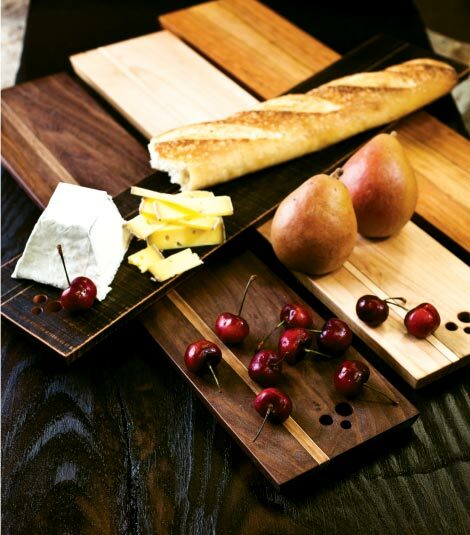 The boards, available at Mountain Made gallery and Nest Organics home store, as well as online, come in multiple sizes, including slender baguette boards. The versatility of his craft allows him to bounce between creating art, custom furniture, and the more recent foodware, which seemed an organic branching off of his work. “I love food, so this was a natural thing to focus on,” Perryman says. The attention to detail in his custom designs, for instance, a tall file cabinet with human-form feet carved from curly maple and a bench that tucks just-so into a client’s circular foyer, translates seamlessly in the pinstripe inlays and precise lines of his utilitarian pieces. Domestically sourced walnut, cherry, and maple, as well as salvaged scraps from warehouses in the River Arts District make up his materials. The cherry in many of his pieces came from a felled tree by his house. “Yard trees produce so much more richness of color than farmed trees,” he says.